We are now at the home stretch of this holiday season. Only 6 more shopping days; countdown to Christmas vacation has begun, as evidenced by the lack of responses to work emails; and everyone is both excited and stressed finishing up projects, closing deals and just getting things done before the clock strikes midnight on December 31st. 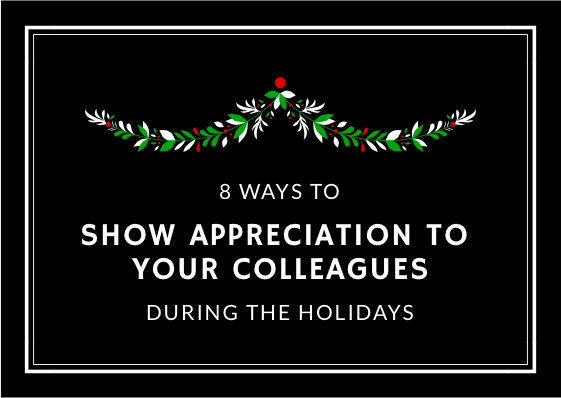 But with all the chaos in both our personal and professional lives, we shouldn’t lose sight of the fact that the holidays are about giving and showing appreciation. And that includes colleagues as well. When you look back at what happened in the year, I bet what you were expecting in January is completely different than the reality of the last 12 months. Projects changed (several times), deadlines were bumped up (several times), budgets were cut (several times), more was added to your plate, but you were successful in spite of it all. And that probably couldn’t have happened without all the people that you work with. Whether it was an extra pair of hands, a sounding board, or brainstorming buddy, your colleagues are your support system at work. Which is why it’s important to not forget them above all this holiday season. Send a heartfelt note of thanks and gratitude to any colleague that supported you and contributed to your success in 2014. Bake holiday cookies and leave them in the kitchen area of your office with a note that says Happy Holidays! Treat a colleague to a cup of coffee and shower them with attention. Engage them in conversation and most important, just listen. Send an email acknowledging someone’s hard work on a major project or initiative and copy their manager. Take a moment to pay someone a compliment and tell him or her why they are so great. Donate a day off to a colleague who used up all their time off and now won’t be able to spend the holidays with their family. Pay your success forward. Offer to mentor someone and take them under your wing. Give away lottery tickets. Your colleague will instantly feel like a winner at the thought of winning the grand prize. What are other ways you give back to your colleagues? Leave them in the comments below. The holiday season is well underway, which means so is the holiday gift exchange. This year, consider getting something other than the usual box of cookies, chocolates or bottle of wine for your colleagues. I’ve put together a gift guide filled with one-of-a-kind, conversation starters. With any of these gifts, you will be the most creative gift giver and memorable one, too!